Interior design is an art and art plays a key role in interior design – it’s a marriage made in aesthetic heaven. 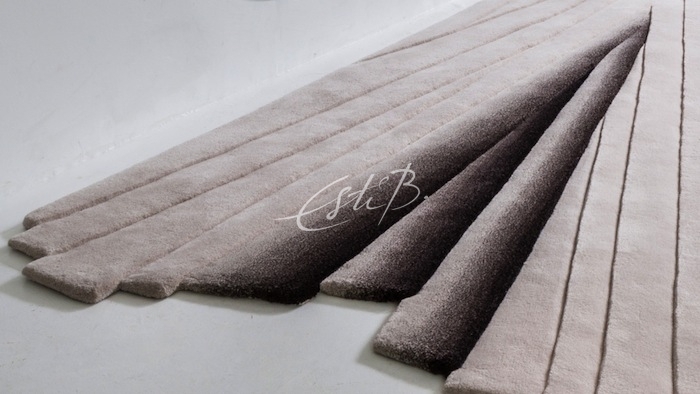 No one knows this better than us at Topfloor, where our founder and design director Esti Barnes creates exquisite rugs that are masterpieces of the textile world. In this blog post we share our thoughts on just how art and interiors can connect with and influence each other – and how that can help you to transform your home. Art can be a painting, sculpture, textile… the common characteristic is that it inspires, excites or moves us in some way. Interiors can do just the same. A home is a sanctuary, where we can express our personalities and experiences. It is also the only place where we can display our own interpretations of beauty. That’s not to say it should be a showcase of artistic pieces that can be seen but not touched – we’re talking about a living expression of ourselves that’s vibrant, exciting and interactive, with the purpose of making our life enjoyable and rewarding. 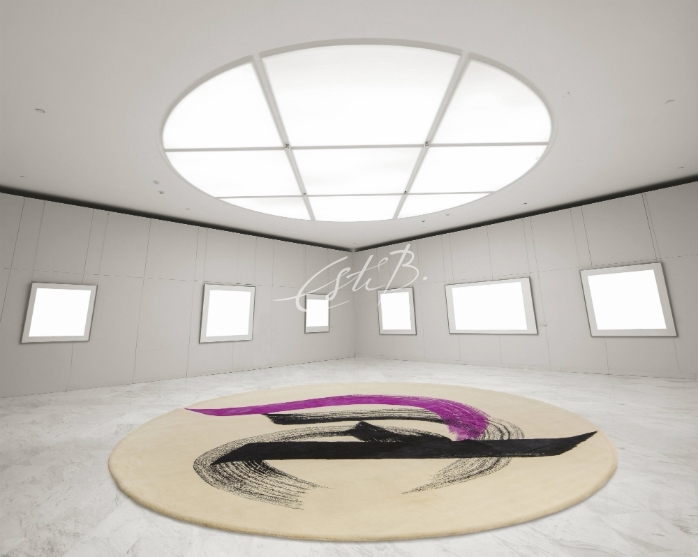 What better way to bring art and life into an interior than with a dramatic rug. 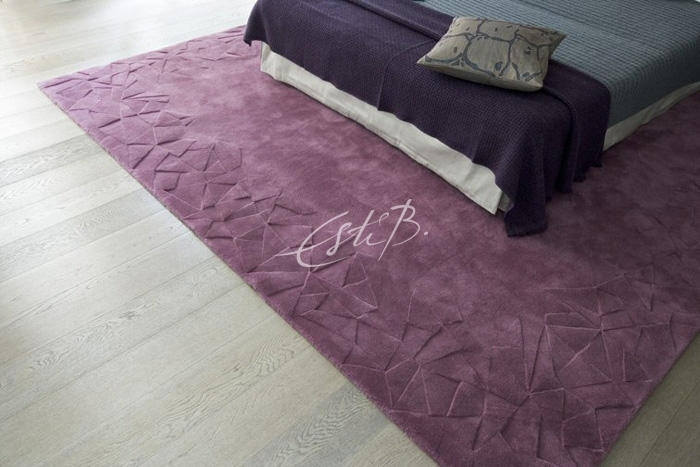 Topfloor rugs are design classics that walk the line between art and functionality. 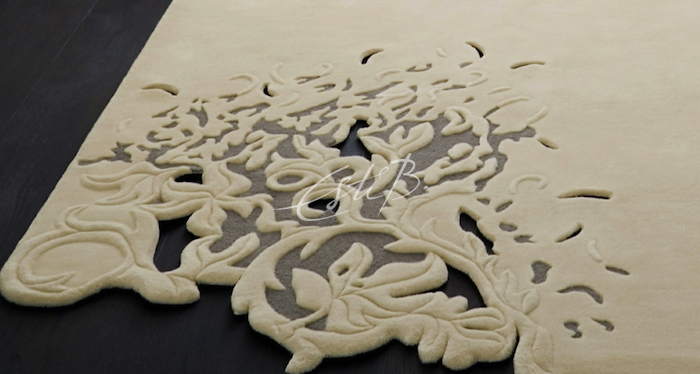 Think of a cross between a piece of fine art and the softest, yet most robust, floorcovering you can imagine. 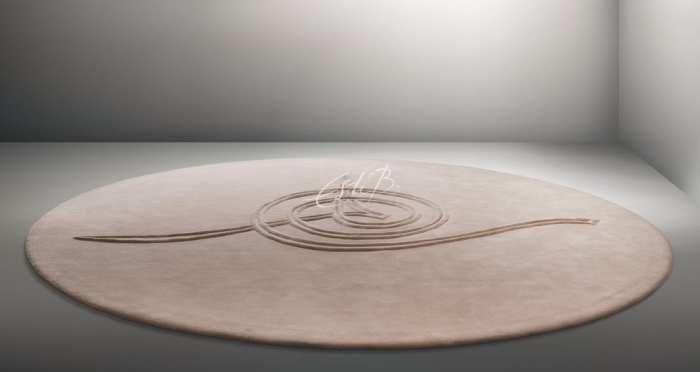 Each piece is the result of an initial creative vision followed by many months of expert craftsmanship to create a unique rug that combines striking looks with sensuous texture. Esti Barnes’ designs all start out as hand-drawn sketches in pencil – as you can see from these initial drawings for our Ecosse rug – and some are interpretations of artists’ works, like the Script collection, which is a collaboration with world-renowned calligrapher Hassan Massoudy. The rugs, including Peace, below, combine Massoudy’s artistic expression with Esti Barnes’ original signature style. 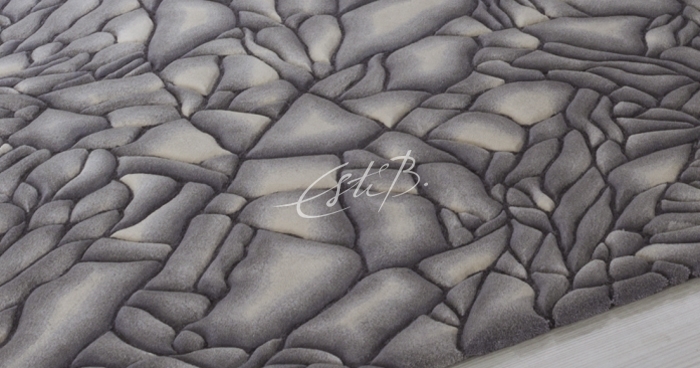 Esti’s latest collaboration, with British designer and photographer Pam Weinstock, transposes Pam’s photographs from nature into beautiful rugs. 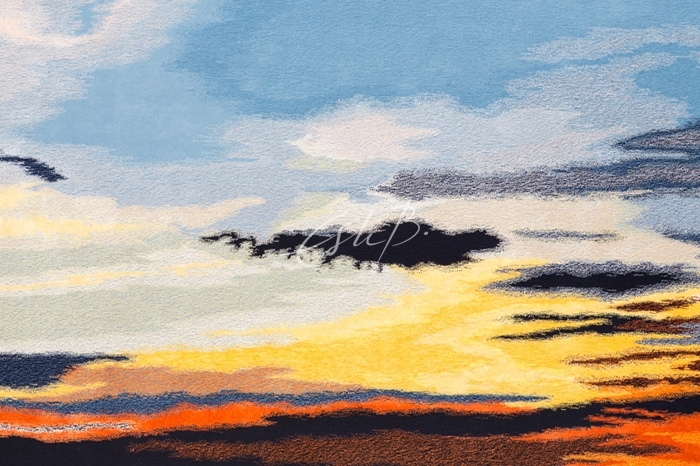 ‘It was a big challenge to capture Pam’s stunning photograph of a Phuket sunset into the rug, with its multiple hues tufted in wool and silk, and give the rug the magical effect that is seen below,’ says Esti. Finding the key decorative piece that turns a room into a stimulating space is an exciting journey, and a specially commissioned piece is a great opportunity to create something personal and distinctive to your own taste and style – whether it’s an imposing canvas or a luxurious floorcovering. 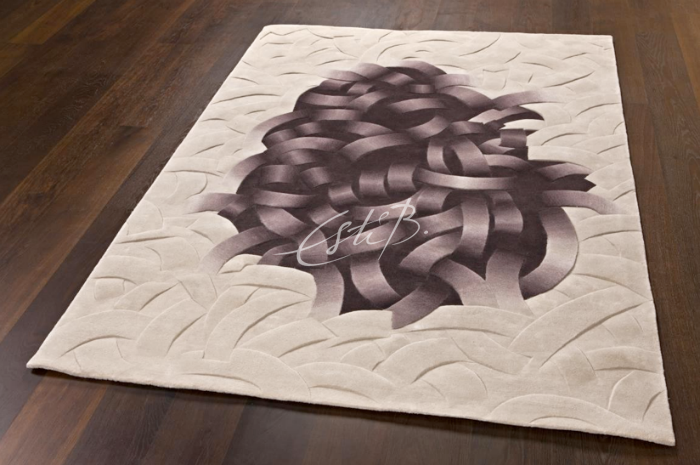 Or you can have a bespoke rug made to your own specification: a one-off piece to take pride of place in your home. We’re not the only ones who think floorcoverings can be art. Many influential artists have used rugs as a channel for their imagination, employing this accessible and tactile medium to bring their aesthetic into people’s homes in an elemental way. In the 1930s, Miró and Picasso exhibited tapestries alongside the paintings that inspired them – often selling the weaves for greater sums than the paintings. Just as in art, inspiration for interior design can come from anywhere – crafts and cultures from far-flung places have long been a source of creative impulse, whether it’s wood carvings from Indonesia or kilims from India. 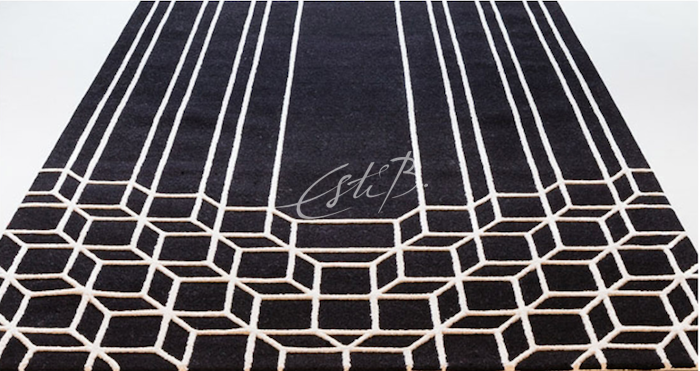 Our Ottomania collection draws on Esti’s own Turkish cultural heritage, inspired by the rich tones and geometric patterns of fabrics from the Ottoman Empire. For more inspiration, or to discuss a bespoke commission, contact us here. The Sunset rug by Esti Barnes and Pam Weinstock will be launched during the Focus 2015 show at Design Centre Chelsea Harbour in London. Join us at 1pm on 22 September in Topfloor’s showroom for an exclusive preview. Click here for more information. 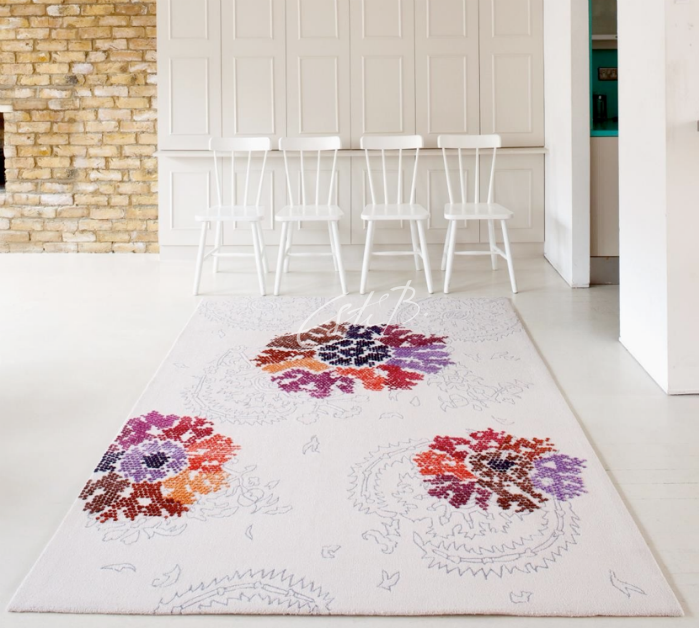 Whether you go for bold colour, an intricate shape, interesting texture or large-scale proportions, a statement rug from Topfloor can elevate any interior into something truly exceptional. And by statement, we mean ‘wow’ – something so eye-catching, it stops you in your tracks, and even makes you wonder ‘how was that made?’. 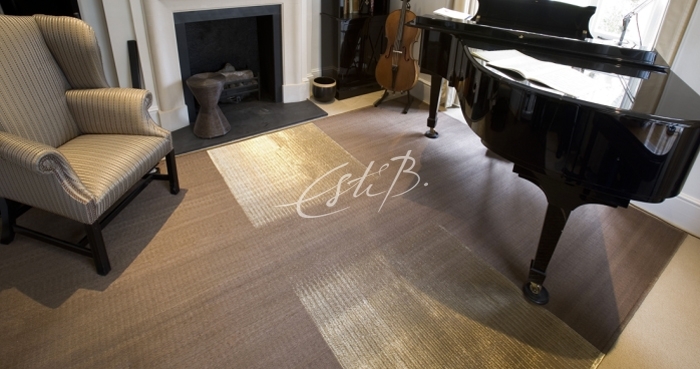 In this blog, we share our tips on choosing the right design for your space, and reveal how you can display your Esti Barnes rug so it really steals the show. First impressions count, so a stand-out rug, like Marlene, above, in your hallway or lobby is a sure-fire way to wow guests as soon as they walk in the door. The hallway should be a taster of your style, revealing what’s to come in the rooms beyond, so opt for a colour and design that reflects the décor throughout and really expresses your style but remember that a statement rug is no shrinking violet – go for a bold pattern or complex shape and you’ll find it will become a real talking point. 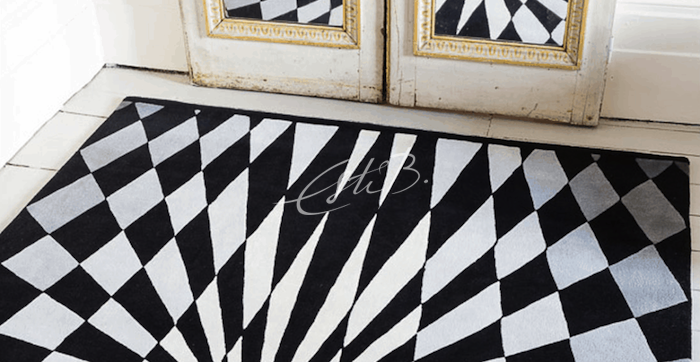 You might think colour is the quickest way to steal the show, but Topfloor’s monochrome Jazz Age designs combine crisp black and white in dazzling geometrics, as well as softer, graduated shades of grey in innovative shapes (the Harlow rug, above), for eye-catching design that gives you free rein to use colour elsewhere in the room. In the dining room, a show-stopping rug can set the scene for a lavish dinner party and by placing the table centrally over the rug, you enclose the dining area and create an intimate mood. Our Garbo design, above, is perfect for this, as the central section is pared-back and understated while the two ends have a more elaborate pattern that will enclose the dining zone. It’s also a good idea to look for a design that enhances the shape of your room – for example, a circular foyer would work best with a design like Patience from our Script collection, where the expansive circle shape reflects the proportions of the room or use the Peace Runner to draw the eye along a galleried space, hall or landing. 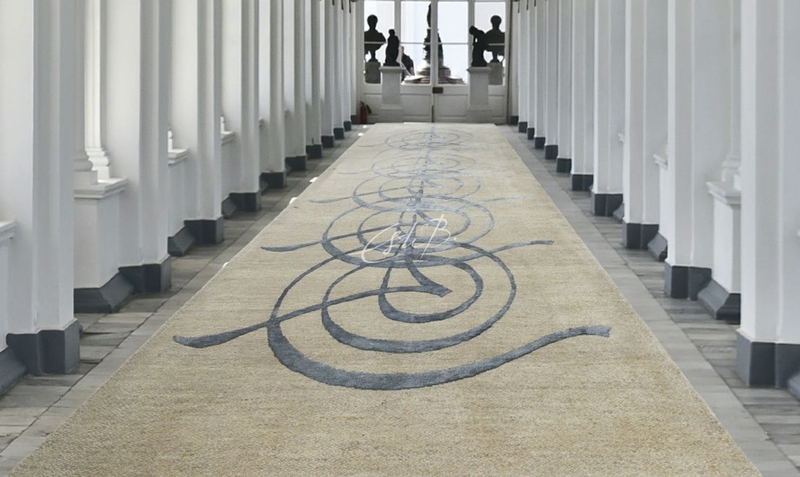 Topfloor’s ground-breaking rug designs are works of art. And a work of art deserves to be shown off to its best advantage, so why not display yours on the wall? Wall hangings have long been used to introduce colour and pattern in interiors, adding depth and a tactile quality to walls. Our Kaftan design from the Ottomania collection, below, is a contemporary take on richly patterned Byzantine tapestries and would make a wonderful focal point. 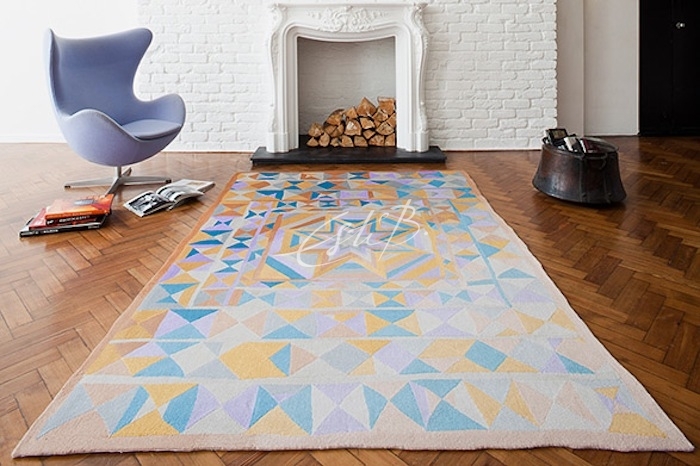 It’s not just colour and pattern that can make a rug really stand out from the crowd. Esti Barnes is renowned for her textured, cut-out pieces, made using hi-tech crafts to create sculptural forms with movement and vitality that look striking and feel wonderful underfoot, too. Place this Ethereal rug onto a dark-wood floor to show off its intricate, lace-like detailing, handmade using a cutting-edge decoupage technique. 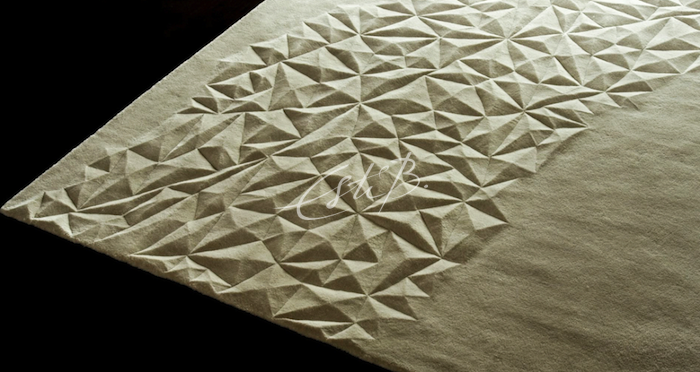 Also part of Topfloor’s 3D collection is the award-winning Esquire, below, surface-carved by hand to produce a multi-faceted crystalline effect that challenges the viewer to reach out and touch it (to make sure it’s not just a trick of the light) and which guarantees it star status as the centrepiece in any room. 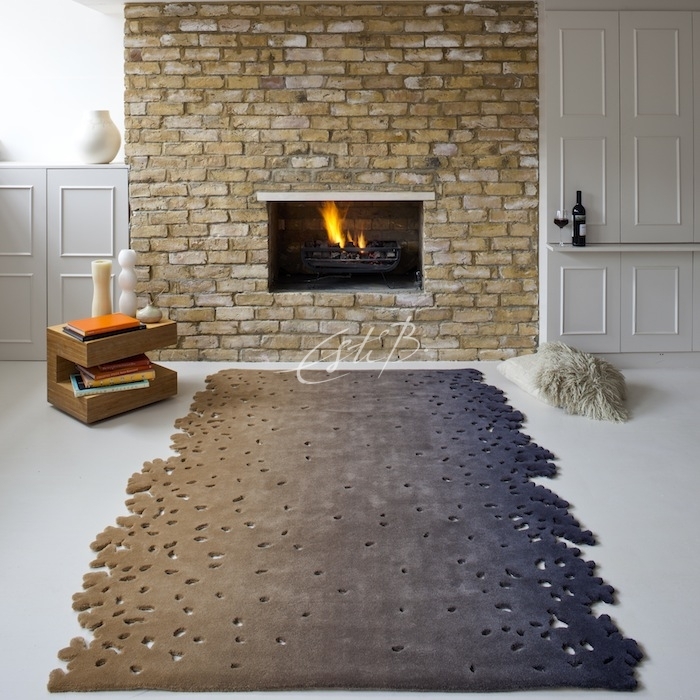 Our entire range of premium-quality rugs is designed to inspire, excite and intrigue, so contact us for more advice and information and we’ll help you find that unique piece to transform your space.